Today the concept of evolution was explained to me by children who knew only a few words of English. I was able to teach them about fifteen English words and they taught me forty Hindi words – ten times as much as yesterday. What changed? We started from the same place – the “language” of images and gestures. But first, I visited a Dog and Cat clinic with A. and a very sick Labrador puppy. One of A.’s cousins had brought him because of stomach issues. Midway through our walk to the vet, we realized the “he” was a “she.” A vitally important detail, I know. I like to give you readers what you want. When we were back, I had my breakfast – egg salad sandwich with a different kind of fresh mango (there are about 1,000 different varieties of mango… seriously!) and a rice-like pudding with raisins. I had time to do some thinking and writing, and then Piyush came to pick me up… on a motorbike! I managed to fit the helmet on my large head (a classic Smrke trait) and we were off, weaving through the traffic. It was a bit of a challenge to stay balanced, but I enjoyed feeling the breeze on my face. A quick note about the weather: it’s been incredibly pleasant. Cool, and mostly dry. I asked Pradeep if the weather was always like this and he said that with the rainy season, nothing is ever sure. Each year is different. Sometimes it will rain all day for days, and even one time it only ever rained in the afternoon. No matter – this rainy season suits me (knock on wood). At this point it would be a little irresponsible of me if I didn’t give you the general structure of my days. “You, irresponsible? Actually, that wouldn’t surprise me.” You say. Oh, you. Each day I have most of the early morning to myself. One of the Ghoshes usually comes to get me at around 10:30 and brings me to their house, where I learn through discussions with Pradeep and Shibani (or whoever else is around) until it is time for lunch. Then I learn how lucky I am to have food made by an incredible cook (this may be my favourite learning of each day). Then I head off with Shibani to the museum school with a task in hand or question in mind to learn by interacting with the children. Pradeep and I discussed my impressions of my (overwhelming) first day learning with the children. I knew that there was so much they wanted to teach me, but language proved a huge obstacle. Before I went to sleep (“For twelve hours!” you say, chuckling) I had thought about what else I could do to try to mend the lines of communication. I thought about the role images could play; that drawing a picture as well as a word could anchor the word better than just writing the word alone. Pradeep helped me realize that yesterday I had been pursuing a very conventional kind of teaching and learning – the call and response game (they said the word, I repeated it). But I was only using sound and this meant that the language barrier did matter. Eventually, we started using body language to communicate as well, but there was still something missing. Pradeep and Shibani encouraged me to try to make my learning and interaction with the students as holistic as possible – to use pictures, sounds, body language and gestures both to learn from them and to get my point across. So, I tried. 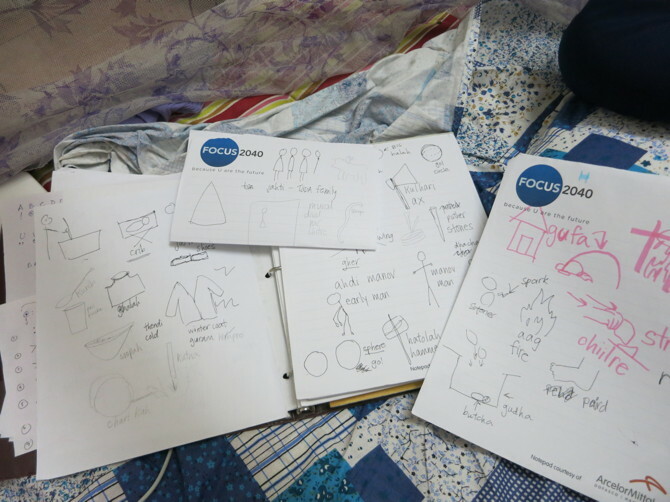 I brought a sketchpad with me and for every word I learned, I drew the picture to show the students that I understood. Of their own accord they also started using more body language and gestures to teach me. Evolution was a prime example; one girl had a boy kneel, then stand up with his hands hanging low, then straighten his shoulders, and with the circular movements of her hands let me know time was passing. “Early man”, “years” and “man” were the two words she used. Did it help that I already knew what she was talking about? Yes, of course it did. Still, she was able to communicate her understanding of the same concept and I think that in itself is an important result. I gave out some paper to the students, and pens, hoping they would want to draw as well. But what happened was that after a few cases where I said the English word after they taught me the Hindi name, they started asking what the English names were for different things. They wrote the phonetic spellings of these names in Hindi on the papers, making a kind of glossary for themselves. We both had fun trying to get the other to say the words right. I found that breaking words up into constituent sounds really helped (“Duh!” you say.) and they were good at letting me know exactly where I was getting things wrong (“No! ‘R’ sound! Rrrrr!”). Those who didn’t have paper were writing with pen on their hands (and didn’t want paper even if I tried to give it to them. Kids after my own heart. I write on my hands a lot, for those who don’t get that reference). Many were eagerly trying out the English pronunciation. I marveled at their fierce desire to learn. The one major concern I had was the size of the group; it was impossible for all of the children to be interacting with me at once, and I think for some of them their two hours could have been better spent. Shibani agreed and will assign me to a smaller group of children the next day. Something else Pradeep and I discussed was potential problems to work through. At the end of my internship, I would like to have a step-by-step guide to approaching problems and arriving at social innovations, a detailed flowchart describing the operation of the Social Innovation Lab and an example of a problem that has gone through the process. I tossed out a few issues I thought were problems, and was surprised when for each one, Pradeep’s question “Who is it a problem for?” made me pause. I hadn’t thought of looking at the “problem” from the perspectives of the people involved in the issue itself. Not switching perspectives meant I was approaching a solution in a way that probably wouldn’t get people to buy in to any kind of change, or that simply wouldn’t be appropriate for their needs or goals. Something else we came back to (continuing a conversation from yesterday) was the role of an enabling environment for creating and sustaining social innovations. In the process of developing an idea, people should feel secure enough to take risks. Once the project is implemented, all who are involved should feel excellent about that involvement. The Ghoshes build this kind of environment in a million small ways. Bringing in very good people, insisting that every single person involved in the project has an equal say, allowing people freedom to carry out their tasks as they wish – all these things I saw for myself. I have read about these practices before, but knowing what they “feel” like and what kind of end result they can produce is something I feel grateful to have experienced. After we bussed back from the school, I returned to my apartment and managed to stay awake until the ripe old hour of 8:30 p.m.
No, I just ate a fresh mango – that’s reward enough! Brianna Smrke, who has been working with the SiG@Waterloo simulation team, is visiting the OaSiS Social Innovations Laboratory in Bhopal, India. She is blogging about her experiences at downwithvowels, which you can also follow here at socialinnovationsimulation.